Monday 4:00 P.M. - 10:00 P.M.
Saturday 4:00 P.M. - 10:00 P.M.
Friday Happy Hour 4:00 P.M. - 6:00 P.M. Please call (301) 375-6105 Mon-Fri 4:00 PM - 10:00 PM for Reservations!! CHECK OUT OUR GOLD, SILVER & BRONZE BANQUET MENUS FOR 10 OR MORE PERSONS. CUSTOMER APPRECIATION SPECIAL ALL DAY EVERY DAY DINE IN AND ENJOY A BOTTLE OF CANYON ROAD CHARDONNAY OR MERLOT, DINNER FOR TWO INCLUDING ONE SHARED APPETIZER, YOUR CHOICE OF TWO ENTREES FROM OUR SPECIAL MENU, ALSO INCLUDING SALAD, BREAD AND BUTTER FOR $39.50 FOR TWO PEOPLE. FOR OUR CUSTOMERS WHO DO NOT DRINK, WE WILL SUBSTITUTE A NON-ALCOHOLIC BEVERAGE AND DESSERT FOR THE CANYON ROAD WINE. 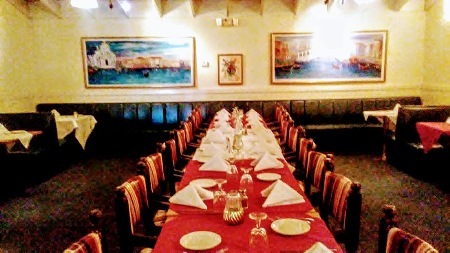 WEDDING REHEARSAL DINNERS, WEDDING RECEPTIONS, ANNIVERSARY PARTIES, BIRTHDAY PARTIES, HOLIDAY PARTIES CALL (301) 375-6105 FOR MORE INFORMATION AND RESERVATIONS..
LET US HELP PLAN AND DO THE COOKING FOR YOUR EVENTS! PLANNING A SPECIAL EVENT? 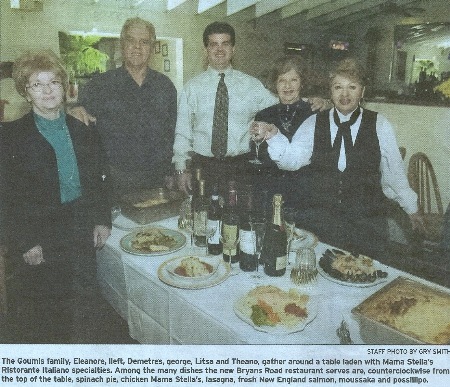 LET US DO THE COOKING FOR YOUR PARTY, ANNIVERSARY PARTY, BIRTHDAY PARTY, WEDDING REHEARSAL DINNER, WEDDING RECEPTION. DINE-IN OR CARRY-OUT DINNER OR PARTY ORDERS. FOR INFORMATION/RESERVATIONS/ORDERS CALL (301) 375-6105. . PLEASE CONTACT US DURING BUSINESS HOURS TO SPEAK TO A LIVE PERSON AT (301) 375-6105 FOR RESERVATIONS OR TO BOOK YOUR NEXT EVENT. OUR FAMILY WELCOMES YOU AND YOUR FAMILY AND FRIENDS! BANQUET FACILITIES INCLUDE TWO PARTY ROOMS, FULL SERVICE BAR, SIT-DOWN SERVICE OR BUFFET STYLE SERVICE. .NOTE TO OUR BLIND OR HEARING CHALLENGED PATRONS: PLEASE HAVE A FRIEND CALL WITH YOUR QUESTIONS/ORDERS. WE REGRET THAT WE DO NOT HAVE THE CAPABILITY OF RESPONDING TO OPERATOR ASSISTED CALLS.
. Banquet Facilities - Luncheon for groups of 25 or more by reservation only please so that we can plan for staffing to serve you as you deserve - ideal for business meetings, birthday celebrations or retirement parties - or pick-up large catering orders for your own in-house parties. Also experienced in hosting dinner meetings, club meetings, either sit-down or buffet as pre-arranged with management every day of the week in one of our two separate party areas. LET US DO THE COOKING FOR YOUR NEXT SPECIAL EVENT. Ask us about carry-out trays of your favorite dishes for your next get-together. COME ENJOY OUR FRESH HOMEMADE EVERY NIGHT SPECIALS. Different specials each DAY, ranging from fresh rainbow trout, fresh croaker, Seafood Neapolitan, Penne Pasta with shrimp, scallops, calamare, or salmon. Also, quesadilla, fajitas, NY steak, grilled combo (steak, chicken, porkchops). Come and see what special treats our chef has in store for you today! NO ALCOHOLIC BEVERAGES WILL BE SERVED TO ANYONE UNDER 21 YEARS OF AGE. NO VALID I.D., NO ALCOHOL.